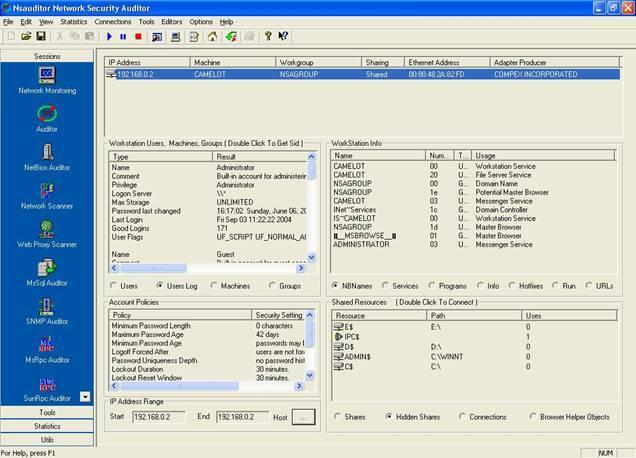 NetBios Auditor is a tool for auditing network. The most security problems appear because of incorrect configuration of NetBios resource sharing. To start auditing click on the toolbar Start button. Note that you should fill the IP Address Range ( Start End ) and the first 3 octets of start and end IP addresses should be the same. ( NBNames, Services, Programs, Info, Hotfixes, Run, URLs) the appropriate fields will be shown. You will also get the information about Account Policies ( including Policy and Security Setting ) and Shared Resources. The information about Shared Resources depends on the selected option ( Shares, Hidden Shares, Connection , Browser Helper Objects ). It is known that the browser helper objects are loaded each time the browser is started up. Such objects run in the same memory context as the browser and can perform any action on the available windows and modules. For ex., a browser helper object can install hooks to monitor messages and actions, etc . Selecting Browser Helper Objects allows you to discover browser helper objects of your computer including parasites and trojans. You can stop the audit process at any moment by clicking on the toolbar Stop button. Note that auditing a computer will take a long time, especially if a wide rang of IP addresses is set.